A Blog about Gardening … The Viette Way! 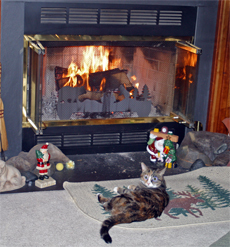 A toasty warm fire in the fireplace or wood stove is a great comfort on cold winter days but what can be done with the wood ashes that accumulate over the winter season? A common question that we get this time of the year is whether or not it’s a good idea to spread these wood ashes in the garden. The answer is … it depends. In many circumstances, wood ashes can be very beneficial to lawns and gardens by providing important nutrients such as potassium, calcium, magnesium, and some trace elements to the soil. Good stuff, right? Well – not so fast. Whether or not it is beneficial to YOUR garden depends a lot on the makeup of your soil and even what you are growing in the garden. You see, wood ashes are quite alkaline and unless they are used carefully, they can significantly raise the pH of your garden soil. This might be okay if your soil tends to be naturally acidic but for areas where the soil tends to be more alkaline like here in the Shenandoah Valley, wood ashes can raise the pH to the point that it becomes detrimental to many garden plants. Maintaining proper pH levels in your soil is as important to the overall health of your plants as fertilizing, watering, and pest control. Why? Soil pH affects nutrient availability for one thing. Certain nutrients like iron, copper, and aluminum become less available to plants in alkaline soils and other nutrients such as calcium and phosphorus become less available in moderately acidic soils. The optimum pH for most garden plants is between 6.0 and 6.5 which is slightly acidic. Certain plants, however, prefer more extreme pH conditions. 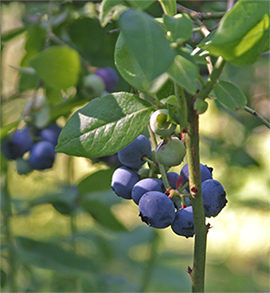 Shrubs such as rhododendrons, azaleas, camellias, and blueberries prefer a more acidic soil; between 4.5 and 6.0. That’s why we often have a hard time growing beautiful, lush rhodies and azaleas here in the Shenandoah Valley unless we add a soil acidifier; our limestone-based soil has a naturally high pH. Before you spread any wood ashes on your lawn or in your vegetable or flower gardens, have your soil tested – at least for pH but knowing the nutrient content would be helpful, too. raise the pH of the soil. 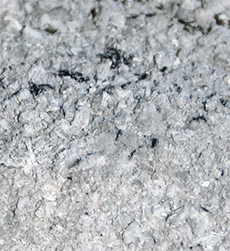 If your soil is low in potassium, wood ashes can provide this important nutrient but in general, it isn’t advisable to spread wood ashes in your garden if your soil pH is above 7.0 and you definitely should never spread them around acid loving plants such as rhododendrons, azaleas, and blueberries. For use on the lawn, wood ash works much like lime except that it is more water soluble and thus works more quickly to change the soil pH. If lime is recommended, dry wood ash can be substituted at the same rate (or even a little higher) – just don’t spread them on a windy day! Never spread wood ashes in an area where you plan to plant potatoes as they can raise the pH to the point that potato scab becomes a problem. Potatoes are less likely to develop scab if grown in acidic soil with a pH between 5.0 and 5.4. Do not apply wood ashes at the time of seeding or around new seedlings. 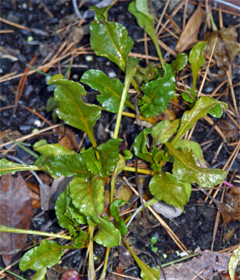 Excess salts in the ash can harm young seedlings. Always spread the ashes out evenly and then work them into the soil. Never leave piles or clumps of ashes in the garden or on the lawn because excess salts from a concentration of ashes can leach into the soil and cause problems for the plants. 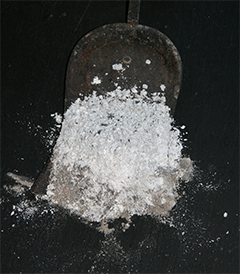 Ashes can also be added (sparingly) to your compost pile. Sprinkle them evenly in a layer and mix them into the pile. Don’t add too many at once. If a soil test indicates that your soil will benefit (or at least not suffer) from a slight increase in pH and some additional potassium and/or lime, then by all means spread your wood ashes! It’s a great use for them and is certainly a cheap source of nutrients and trace elements. However, never use the ash from burning coal, pressure treated or painted wood, or from burned trash or cardboard in the garden as these contain harmful byproducts. The bottom line – wood ashes can be a great soil amendment if used carefully and moderately. BUT, before you start spreading, be sure to have your soil tested! Until next time – Happy Gardening! This past summer I decided to set up a small raised garden planter on our deck to try and grow a few vegetables. It was just an experiment because I wasn’t sure if the deck got enough sun. I had a raised bed kit from Scotts Miracle-Gro that I thought would be perfect for the test. This kit included 3 modular units that you could set up in various ways; from 3 side-by-side units to a stack of 3 to make a really deep bed. Each unit was 2 feet by 2 feet and 6 inches deep. I decided to grow carrots and beets because I figured that if I filled the beds with some nice loose potting soil, I could get beautiful root crops – plus we really like beets and carrots! For this purpose, I set up one bed that was 2 units deep (12″) for the carrots and another right beside it that was one unit deep for the beets. It seemed like the perfect setup. 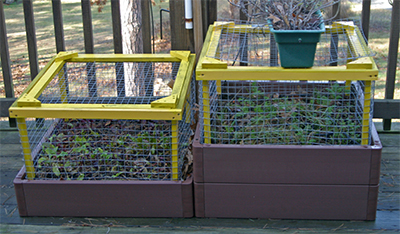 The setup with wire cages to protect the plants from the critters. Since we were setting this up on the deck and the units didn’t have a solid bottom, we wanted to do something so that the soil wouldn’t be sitting directly on the wooden deck. To accomplish this, Eric cut 2 pieces of plywood that were slightly smaller than the inside dimensions of the unit and those became the bottoms of the 2 beds. We set the plywood on low wooden blocks so that it wasn’t sitting directly on the deck. The kit came with squares of landscape fabric which we placed on top of the plywood and up the sides of the units to keep the soil from spilling out at the bottom. It actually took quite a bit of potting mix to fill these beds but I felt that if it worked, the soil would last a few years. Since this whole project was an experiment, I decided to try using seed tape for planting the carrots rather than sowing the seeds directly. 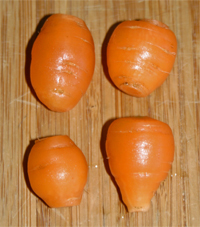 Carrot seeds are so tiny and, as hard as I try not to, I always sow them way too thickly. I thought this would reduce the amount of thinning – I hate throwing baby plants away! 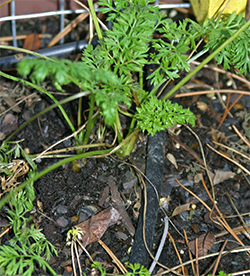 I did plant some ‘Cosmic Purple’ carrot seeds and another variety of short carrots (I can’t remember the variety) between the rows of seed tape. Three lines of drip irrigation placed in each bed kept the plants evenly watered. In the single bed, I planted beets; 2 rows of golden beets and 2 rows of Detroit beets. I figured they didn’t need as much soil depth as the carrots. We really love beets and were hoping to get a bunch from this planting. After the beds were set up and planted, Eric added drip irrigation to keep the plants watered as they grew. All the containers on our deck are connected to a drip irrigation system that Eric set up many years ago. It’s great; the system is on a timer which is set to water the containers once every three days. He did this after we lost all our hanging baskets one summer while we were away on vacation. It keeps all the deck plantings thriving throughout the summer and keeps the bird bath full! Anyway, most of my seeds germinated but the plants never seemed to flourish. It could have been the soil but more likely it was the light conditions. The deck faces almost due west but because of the large pines and a beautiful hickory tree, it gets dappled sun most of the afternoon and full sun only after about 6pm. The other problem was that early on when the plants were still pretty small, the squirrels (or something else) started digging in the beds. They weren’t actually eating the plants but they were definitely disturbing the soil so Eric built a wire enclosure with a lid to protect them. The plants continued to grow slowly all summer but like I said, they never thrived. I let them go through the fall and every once in a while I would think about checking them to see if there was anything to harvest but I never did. The tops remained green through December with no protection from the cold but I still didn’t check them. I could see that the beets hadn’t done much so I assumed that the carrots hadn’t either. Two Nantes Half Long carrots freshly harvested January 12th! Experiment failed – or so I thought. Last weekend when the weather turned so unseasonably warm, I opened the sliding doors on the deck to let in some fresh air. That’s when I FINALLY got curious enough to check the carrots. 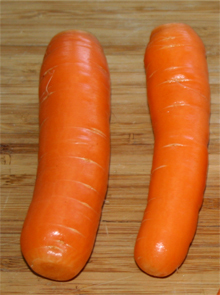 I pulled up one of the plants with the “biggest” small top and to my surprise there was a beautiful, firm, and perfectly shaped Nantes Half Long carrot. I pulled up some more and found a variety of sizes but most were very beautiful and nicely shaped. How did they taste? Amazingly delicious – so crisp, so tender, and so sweet! Yum! The cold temperatures have made them nice and sweet. And there are still many more to harvest! My experiment was a success for the carrots but not for the beets. I think I’ll try again next year but this time I am going to dig out about half the soil and replace it with some Blue Ridge Organics “Super Compost”. I’ve been told that this amazing compost mix grows fantastic vegetables (and flowers). I’ll be sure to let you know! Never miss a post! You can be notified by e-mail whenever I post a new gardening "story"!